T. Randall Lee, Cullen Distinguished University Chair in chemistry and associate dean for research in the UH College of Natural Sciences and Mathematics, is working with a colleague in Taiwan to use hollow gold-silver nanoshells to boost the efficiency of photocatalysts to generate hydrogen from water, powered only by sunlight. Hydrogen holds promise as an inexpensive form of clean energy, but finding an efficient and affordable way to produce the fuel from water – a technique known as water-splitting – remains a key scientific challenge. 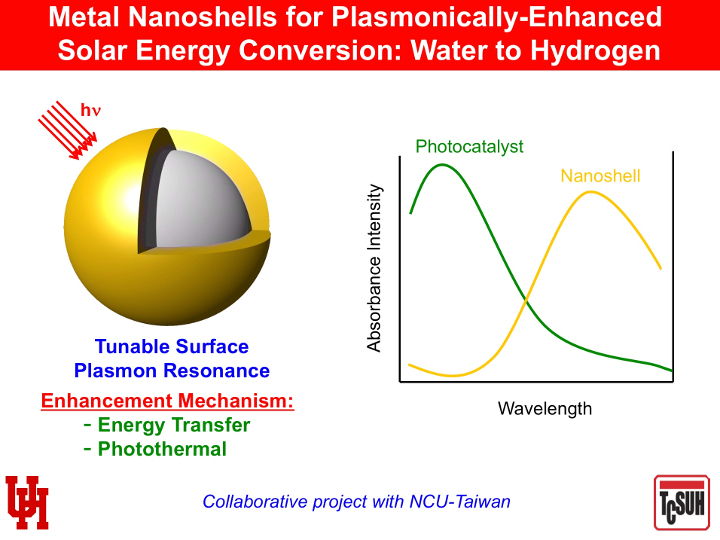 A researcher from the University of Houston is working with a colleague in Taiwan to use hollow gold-silver nanoshells to boost the efficiency of photocatalysts, where the combined nanocomposite materials generate hydrogen from water, powered only by sunlight. Randall Lee, Cullen Distinguished University Chair in chemistry and associate dean for research in the UH College of Natural Sciences and Mathematics, said the nanoshells allow the composite photocatalyst system to absorb a wider spectrum of available light, enhancing the ability of the photocatalyst to separate hydrogen from the water, leaving only oxygen as the byproduct. Lee also is affiliated with the Texas Center for Superconductivity at UH. His work on the project is funded by a $150,000 grant from the U.S. Air Force Office of Scientific Research and follows several years of participation in the U.S. Air Force-Taiwan Nanoscience Initiative. His collaborator, Tai-Chou Lee of National Central University in Taoyuan City, Taiwan, was a former post-doctoral researcher in his lab at UH. Hydrogen can be used in the form of fuel cells to power electric motors or burned in internal combustion engines. But finding a practical, inexpensive and environmentally friendly way to produce large amounts of hydrogen gas has been elusive. Most hydrogen today is produced through steam methane reforming and coal gasification, methods that lack portability and raise the fuel’s carbon footprint despite the fact that it burns cleanly. Being able to produce hydrogen reliably and cheaply using only water and sunlight would be a major breakthrough. Lee’s laboratory focuses on nanoparticles, nanoscale thin films and coatings and other nanomaterials for the energy and health care industries, while Tai-Chou Lee – the two are not related – works in photocatalysis, using light to trigger a chemical change. UH's Lee said putting the two together – using surface-modified hollow gold-silver nanoshells to boost the efficiency of Tai-Chou Lee’s catalyst – is a marriage of fundamental research with an end application. While traditional photocatalysts typically absorb light in the ultraviolet and short-wavelength visible ranges, adding the nanoshells allows the catalyst system to make additional use of long-wavelength visible and near infrared wavelengths, boosting its overall efficiency. The researchers last year published early results from the work; Lee said the latest grant will allow him to enhance the efficiency of the nanoshells, which are made from a combination of gold and silver but coated with a dielectric material that is critical to achieving abundant hydrogen production. “If you can use sunshine to generate fuel from water, that’s a really clean source of energy,” said Lee.